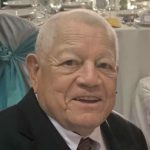 Robert Guzman, age 88, of Yorkville, IL passed away on Tuesday, February 5, 2019 at his home surrounded by his family. He was born on August 24, 1930 in Eola, Illinois the son of Manuel and Petra (Rangel) Guzman. Robert was united in marriage on May 26, 1956 to the former Lois Joanne Mount and they spent the next 62 happy years together. He was a loving husband, father, grandfather, great grandfather, brother, and uncle who will be deeply missed by his family and friends. Mr. Guzman was a member of St. Patrick Catholic Church in Yorkville, IL. Robert served his country proudly as a sergeant in the United States Army during the Korean War in which he was awarded two bronze stars. He was employed for 45 years by the Arnold Lies Company in Aurora, IL until his retirement. Robert was a proud member of Union Laborers Local 149. He was a former member of the Aurora Moose Lodge, the Lucky 50 Club, and the Turners Club all of Aurora, IL. Robert was a lifelong member of the VFW and the former American Legion Post, both in Aurora, IL. Mr. Guzman was proud to be on the Honor Flight Chicago on October 11, 2017. Robert was a former member of the Aurora Clippers Football Team. Robert and his wife Joanne were very active with the Kendall County Senior Center in Yorkville, IL. He enjoyed fishing and camping with his family and friends. Robert loved being with his grandchildren and great grandchildren. He is survived by his wife, Joanne Guzman of Yorkville, IL; his children, Jeffrey (Laura) Guzman of Kaneville, IL, Mark (Robin) Guzman of Yorkville, IL, Lori Anne (William) Hanson of Yorkville, IL, Wayne (Ellie) Guzman of Oswego, IL, and Mary Lynn (Jeff) Pawlowski of Oswego, IL; his nineteen grandchildren and twenty-five great grandchildren; his brothers, Rudy (Sonja) Guzman of Bettendorf, IA, Butch Guzman of Aurora, IL, and John (Anne) Guzman of McKinney, TX; his sisters, Carmen Lewis of Aurora, IL, Josephine Stevens of Aurora, IL, and Rosemary Martins of Milwaukee, WI; as well as many nieces and nephews. He was preceded in death by his parents, Manuel and Petra Guzman; and his one great grandson. A Funeral Mass will be held at 10:00 AM on Friday, February 8, 2019 at St. Patrick Catholic Church, 406 Walnut St., Yorkville, IL with Father Gabriel Cillo, M.I.C. officiating. Interment will follow in River Hills Cemetery in Batavia, IL. Friends may visit from 3:00 until 8:00 on Thursday, February 7, 2019 at the Nelson Funeral Home, 1617 N. Bridge St., Yorkville, IL. Arrangements by Nelson Funeral Homes & Crematory, www.NelsonFuneralHomes.com or 630-553-7611. Y deepest sympathy for the loss of your loved one. May you find comfort in loving memories and hope in the promise of resurrection found in Jehovah Gods word. Isaiah 25:8, Acts 24:15, Psalms 37:29. You are finally pain free and at peace. Rest well. I'm glad to have known you and Joanne.. Marigold.